Food delivery is a big business in the Middle East & North Africa. So big that MENA accounted for almost half of the 2018 revenues of Delivery Hero, the Berlin-headquartered global food delivery giant that as of today has a market cap of $7.38 billion. There are multiple local, regional, and global players operating online food delivery businesses across MENA but Egypt, the largest country of the region with a population of over 100 million, almost 40% of which uses internet, has been dominated by a single entity, Otlob. But that is starting to change. Uber Eats expanded to Cairo last year and European on-demand delivery startup Glovo also launched their services delivering food among other things. And late last year, homegrown restaurant discovery platform Elmenus also decided to join the club. Having started the online food delivery service in select areas of the city, Elmenus has been able to make it available almost all across Cairo in less than four months and has some very ambitious expansion plans. Elmenus founder and CEO Amir Allam thinks of this expansion as a natural evolution for the company. “We’ve been around as a discovery platform for a couple of years and have over 1 million monthly users relying on us for their daily food decisions. It was the natural evolution for us and for the users on our platform. We want to enable them to order their food deliveries in an easier manner online, with the click of a button,” he said, speaking to MENAbytes. “The pressure came from our own users who didn’t want to have to go to another platform to order their food after deciding on Elmenus,” he added when asked if the decision to expand into deliveries was in any way influenced by the pressure to find a sustainable business model. Elmenus all these years has been relying on advertising as a business model. The startup sells targeted advertising spaces on its platform but with the launch of online food ordering service, that is obviously changing. They’re now charging restaurants a commission for every order that they send their way. Advertising still contributes to most of company’s revenues but at its current rate of growth, online order will become company’s main revenue stream, Amir told us. Even though the startup has been operating in this space for years, expanding into food deliveries was not easy. 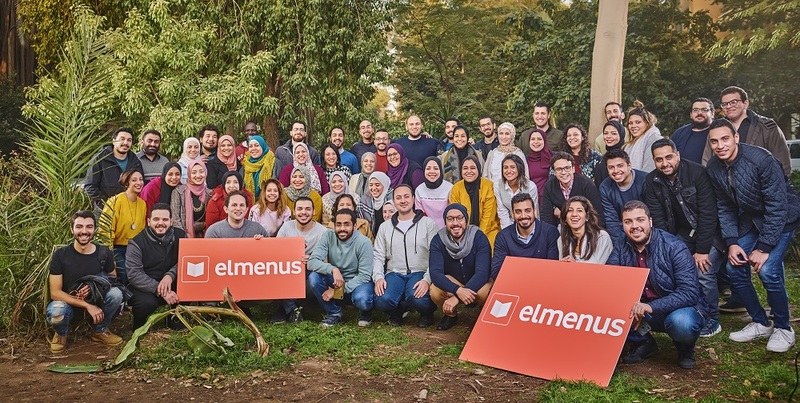 Elmenus had to totally revamp its product and grow the company from 25 to over 100 employees in less than a year, after it raised $1.5 million Series A in 2017 from Algebra Ventures, which at the time was one of the biggest funding rounds secured by an Egyptian startup. “The pre-launch phase was full of user and restaurant interviews, research, beta testing, pilots and ensuring that the best experience for both our restaurants and our users. We set up a whole support center, built 3 teams from scratch and expanded our employee base to ensure that the many moving parts of such a big operation are working together in unison to deliver a simple yet smooth experience to our users,” said Heba Oraby, COO of the startup. That’s not the only edge Uber Eats has over Elmenus. They obviously have much better resources at their disposal. Both Uber and Delivery Hero can continue injecting crazy amounts of cash to push Elmenus against the wall. And for now, it’s just Uber Eats and Otlob but Delivery Hero-owned Carriage and Careem Now are also expected to enter the market within the next few months. “We serve them and solve their problems, rather than spending millions on food discounts to buy users’ loyalty. We’ve been able to acquire a significant amount of market share in such a short time without spending heavily on marketing or discounts and that speaks volumes about our initial success,” he added. Elmenus’ website is currently the most visited website in Egypt in this specific category with 900,000 monthly visitors on average. Otlob, its closest competitor receives 650,000 visitors a month. This is not a conclusive indication of who is more popular as a very big number of users prefer making their food decisions on mobile through native apps. But it still gives a pretty good idea of where things stand. And this is what makes them different from their competitors, the food discovery element. “We are a platform that is focusing on what we believe is the hardest question of all, “What will I eat today?”. We answer that question by providing users with a comprehensive listing of over 6.5K restaurants and 900K dishes and are focusing our experience on answering that question on the dish level. You open Elmenus and you see photos of dishes in different restaurants rather than exploring a list of restaurants you aren’t really familiar with,” noted company’s CEO, speaking to MENAbytes. Amir did not share the numbers of orders they currently process on daily basis but said that they now have over 300 restaurant partners using Elmenus to deliver food and the service is being used by tens of thousands of users. These are still early days for Elmenus, the food delivery platform, and the time ahead is going to even more difficult with increased competition. But if Elmenus could actually convert a decent number of people who use its website and apps to discover food and restaurants and deal with the operational pains that come with this type of business, it could very well go on to become next homegrown success story of MENA in the food delivery space.